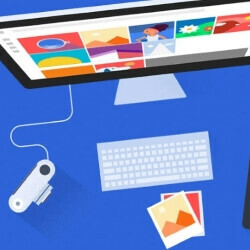 Google has added new updates to the Photos app, making it more convenient to use some of its most popular features. For example, sharing has been significantly streamlined and improved. Users simply pick photos, tap "share" and select their contacts – if they have Google Photos, they will receive a notification. And if they don't, they'll get links via SMS or e-mail. This way, you don't have to toggle between different apps as much, or deal with failed texts and email attachments. Google has also added "concepts" to the app's video generation features. Using your uploaded photos, the app can output a video showing how your child is growing up. This is the first concept, and more are scheduled to arrive this week – one for summer videos, and another one for formal events like weddings. These videos get generated automatically, with users spending no time editing or being involved in their production. The Google Photos updates are being deployed on Android, iOS, and the web. Previously, Google added a motion stabilizing feature to the app, letting it generate very steady and cinematic GIF images.